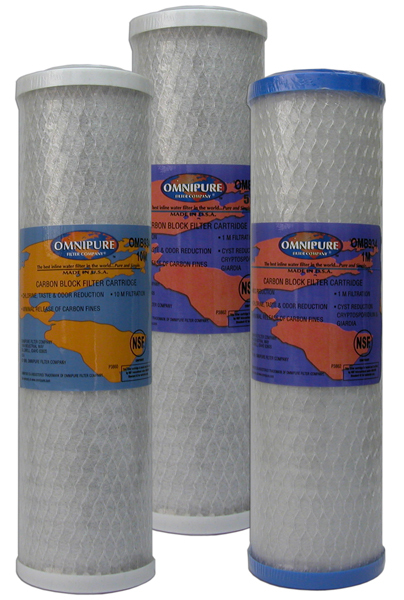 Omnipure OMB Series Carbon Block Filter Cartridges | Applied Membranes Inc.
Omnipure’s OMB-Series of replacement cartridges feature the new OmnipureBlock™ media. This high quality carbon block media is manufactured from raw materials to precise specifications entirely at the Omnipure manufacturing facility. Filter elements are available in 10 micron, 5 micron and 1 micron formulations. Filter cartridges are finished with a single layer of spun-bonded polypropylene netting. Polypropylene end caps with compression gaskets are standard. OMB934 1M, OMB934 5M, and OMB934 10M filters are tested and certified under ANSI/NSF Standard 42 & 53 for materials only.